Yes- totally agree that this should not be termed alpenglow. Similarly I am totally for mountains/places such as "Everest" be referred to as Qomolongma or Sagarmatha, K2 back to Chogoli and so on.Why should the Western names dominate over names of places that have existed way before Westerners step foot on them. If NZ\'s Mt Cook can be reverted to Mt Aoraki and Mt Egmond to Mt Taranaki, why couldn\'t we pay similar respect to the people who live their lives and pay homage to these mountains? 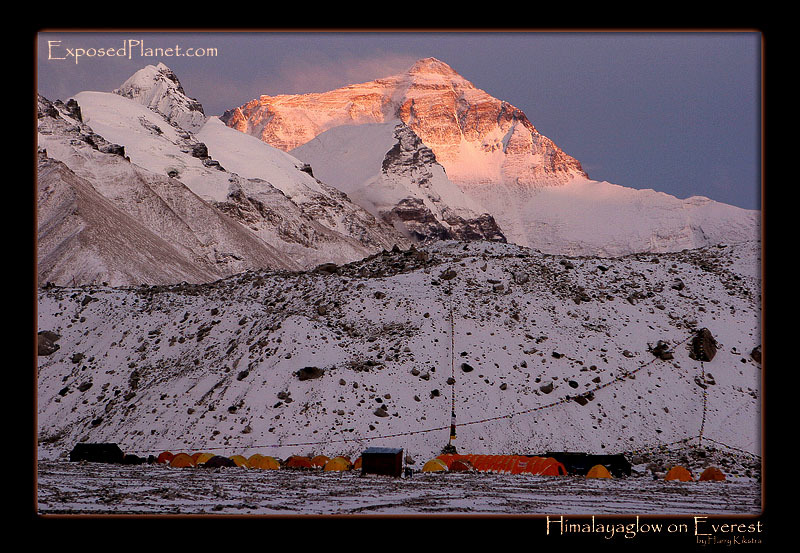 The story behind "Alpenglow on Everest, Himalayaglow?" It was very chilly when I arrived back in basecamp, as the camp was covered by the shadows.. But the sight of the setting sun illuminating the top of the top of the world, warmed me up again.. Somehow the word Alpenglow is used for all similar colours at the end or beginning of the day. Though it is named after the beauty of the Alps, so maybe here it should be Himalayaglow..